I hope everyone was able to get out today and enjoy National Running Day! I had a great post-work run with my friend, Brigitte, and it was just what I needed. 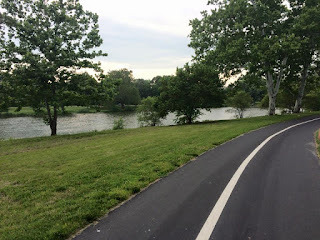 I've been in a bit of a self-imposed running reprieve following my three half marathons this spring, with the exception of a few smaller races in the past few weeks, but I felt like I couldn't let National Running Day go by without a run of some sort! I had a bit of a headache and was well on my way to talking myself out of a run, but Brigitte mentioned that she was going to go for a run. We work very closely to one another, so I asked if she was going to run at the park near us and when she said yes, I asked if she wanted a running buddy. We met up at the park and had a great run. It was just what I needed; a gorgeous night, quality time catching up with a friend, no set mileage, no watch, just a run for the sake of running. It was perfect! setting a positive example for my sons and other family and friends. Seeing my oldest son participate in 5k races makes this Mama so proud and I know that his little brother won't be too far behind him in the future! I also can't say enough how proud I am of my Mama for taking on a 5K each month this year! She is an amazing woman (and a badass) and I love cheering her on as she works toward her goal! a chance to re-group and balance myself. I know that taking time for myself is so important and running makes me a better wife, mother, daughter, and friend. strengthening existing friendships and creating amazing new ones. Running has given me the opportunity to deepen existing friendships that I cherish and it has also opened an incredible door to new friendships that mean the world to me. 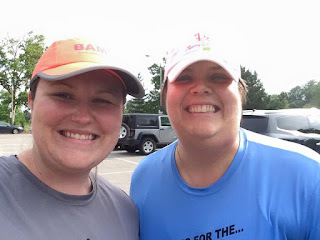 Whether it has been virtually through the blogging world or through social media or friends I've met through Another Mother Runner (my Napa girls!!) or at races and local running groups, I am forever changed by these friendships. I am inspired by all of you and I can't thank you enough for the support you've given me! What has running meant for you? I have to brag for a minute on my Mama. She's one pretty amazing woman for a multitude of reasons, but I am going to brag today about her goal for 2015. She's committed to doing a 5K every month in 2015! I am so proud of her for setting this goal and I love cheering her on at each race. 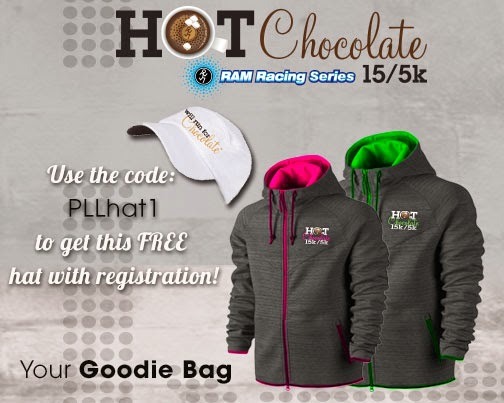 She actually got a head start on 2015 by participating in the St. Louis Hot Chocolate 15K/5K last December. She and my oldest son did the 5K and I love the pictures of the two of them crossing the finish line together. On New Year's Day, she, Nick, and I did the Commitment Day 5K, which was a great way to start the new year! My Mama even challenged herself to run a bit of the race and Nick was happy to run with her. Mid-race selfie; three generations of our family! 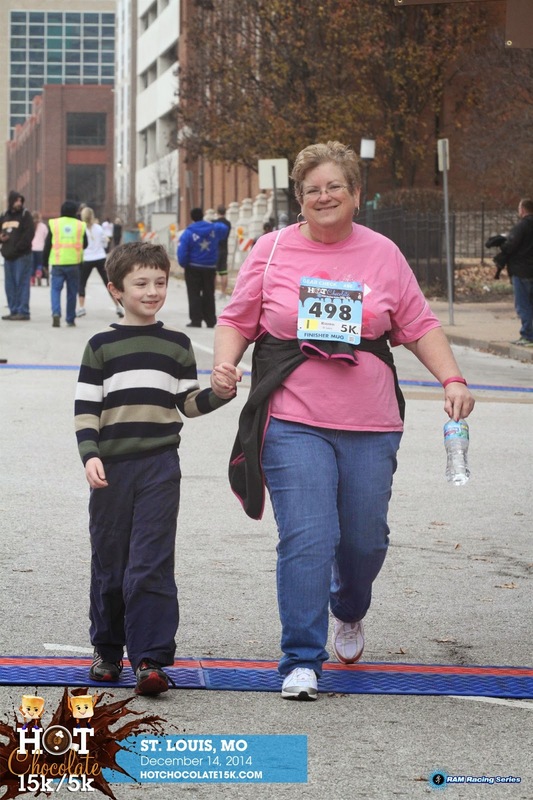 In early February, Mom and I participated in the Missouri Lottery 5K Run for Your Beads and the best part? The race ended with beer and Hurricanes! Hurricanes and I are old friends so it was nice to be reunited at the end of the race. There was also a Hurricane stop mid-way through the race, but Mom and I decided to forge past it to get a bit ahead of the pack. Mom at the finish line; she would want to point out the people behind her. She was very proud of the fact that she was not last! This past Sunday, we participated in her March race, the Boots and Badges 5K benefiting The BackStoppers, Inc. I think Mom would tell you that this was her hardest race, mainly due to the fact that she was under the weather that day, but it's the race that I am most proud of her doing. Had it not been the end of March (therefore limiting the time she had left to complete her March race), I suspect she would have skipped this race, but she was a trooper and got up early on race day and came downtown with me. Although she likened this race to her own personal Bataan Death March (absolutely no disrespect intended towards the brave POW's who perished on, or endured, the actual Bataan Death March), she continued to put one foot in front of the other and she finished the race like the trooper she is! She's got her April, May, and June races on the calendar and is looking forward to the rest of the year, too. It's been fun doing some new (to us) races as we complete her goal! Mama, I hope you know how proud of you I am! I know that it's hard for you when we are last in a race, but believe me when I say that being last is better than not starting! You are doing a great thing and I can't wait to cheer you on at the rest of your races this year! I'd love to shower my Mama with kudos, because she really is a rock star, so if you have any words of encouragement for her, feel free to comment below! "Don't sweat the road ahead, smile at the road behind you." Just a quick post tonight as I'm fighting some sort of cold/allergy/sinus "thing" and I think my bed is calling me! I've also managed to lose my voice, which is not optimal, but I'm sure my hubby and the boys are slightly grateful. 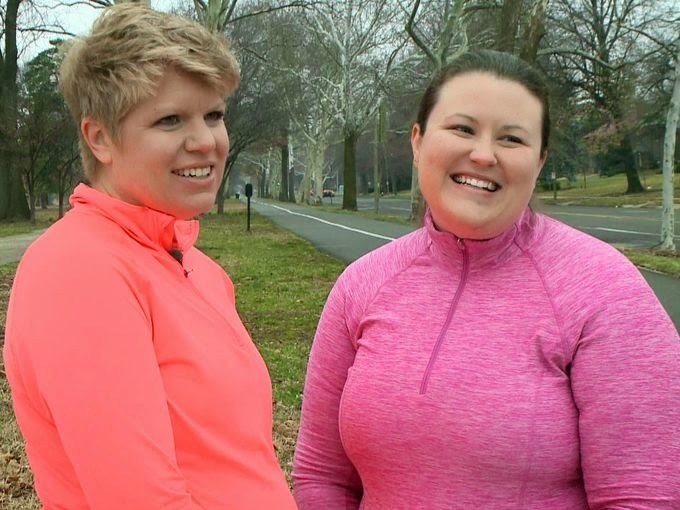 I mentioned that last week that my friend, Stacy, and I got to talk to a local reporter for a story they were working on about women runners and the story aired yesterday on the morning news! I wasn't expecting the story to air for a few weeks, so I was pleasantly surprised when a co-worker e-mailed me on Wednesday morning and asked if it was my picture that she saw on the KSDK website. I hopped on the website and sure enough, in advance of the story airing, there were some great pictures of Stacy and I from our interview. We didn't intentionally color coordinate our outfits, but aren't we cute? We got an e-mail from Nichole at the news station telling us that the story would run during the 6 a.m. hour on Thursday and I was thrilled with how it turned out. I was nervous about being on camera and being awkward, but Nichole was really easy to talk to and I think I managed to keep the awkwardness to a minimum. I loved the soundbites that they used in the story and the footage of us running was great, too. Check out our television debut here! As mentioned in the story, if you'd like to support Nichole and Sara as they train for the upcoming GO! St. Louis® Marathon and Family Fitness Weekend, please click here. The NBC station that gathers the most support will have their anchors flown to New York City to run the MORE/FITNESS/SHAPE Half Marathon with Natalie Morales and Erica Hill! Every pledge counts and I'm happy to support Nichole and Sara on this journey! Speaking of runching, I was able to get out for two runches this week, which felt great. I'm glad I got those runches in, too, before I started feeling blah! I've also been drinking a lot of water this week and I didn't eat out for lunch at all, both of which are huge accomplishments for me as of late. Here's to baby steps to get back on track! I still feel really pumped from the excitement of last week and I've even started a bit of research about how to pursue my writing dreams! I put some pretty big, scary goals out there, but I've also taken some time to re-evaluate an existing big, scary goal; my Declare It Day Goal. My goal was to do a 2:30 half marathon by the end of 2015. I knew when I put that goal out there that it would be a huge challenge for me, but over the past few weeks, I've realized it is almost an impossible goal and I feel as though I'm setting myself up for failure. I'm generally a pretty optimistic person, but considering my time in Little Rock a few weeks ago was 3:26:53, I would need to take almost an hour off of my finish time and I'm just not sure that is feasible in the next 8 1/2 months. Here is a bit of the current battle in my head. On the one hand, I feel like I need to, and want to, commit to the goal I set out to do. I mean, I put it out there on the Internet for goodness sake! Is it going to be hard? Hell yes, but I'm not one to back down from a challenge. On the other hand, is it really an attainable goal given the state of my running and my weight at the moment? I plan to work on both this year, but I feel like I am starting from square one and I'm not sure this is the right goal for me right now. Or am I just shying away from this goal because it's going to be really hard? Maybe, but I usually don't shy away from a challenge. I'm also not exactly at my mental or physical, I can do anything peak. My friend, Stacy, asked me what led me to the 2:30 goal and I truly can't articulate why I chose that time goal. It has always been the number that I think of when running a half and I realize, that isn't a good premise for a goal, but it's just stuck in my head as the holy running grail for me. I think it might be better for me to revise my Declare It Day goal to run a 2:45 half marathon. It feels like a cop out to back down from my original goal, considering that the point of a goal is to push your boundaries and challenge yourself, but I also think that your goal should be somewhat attainable and I just don't foresee a 2:30 marathon in my future this year. I think a 2:45 half is certainly still quite a challenge and will involve a lot of hard work, commitment, and focus on my part and it is at least in the realm of possibility for me. What do you think? Is a 2:30 half marathon a reasonable goal considering that would involve a nearly 60 minute improvement over my current time? Or is it reasonable to re-evaluate and set a revised goal? Along these same lines, I saw the below quote at a local high school this weekend and I adore it! However, it does make me wonder if all of the above thoughts are just obstacles because I've taken my eyes off my 2:30 goal. The internal dilemma continues! Friends, I think I have turned a corner! For so long, I have felt uninspired and unmotivated and I had no clue how to pick myself up by the bootstraps and get back in my zone. I think I can honestly say, though, that the past few days have given me my mojo back! A series of events and experiences has brought me to this point and I feel inspired, motivated, empowered, excited, and like I have a renewed sense of purpose. I have been buzzing all day and have likely scared a few of my friends and co-workers in the process, but I can't contain my excitement. Don't let other people put you in a box. Other people's biases are just that. Their biases are their problems, not yours. You belong at the table, you belong as a participant in important conversations. Make your presence known. Speak loudly and confidently. Words of wisdom from Kathy Mazzarella. I walked away from the event feeling like I could do anything and I can. Maxine's comments helped push a thought/dream/goal to the forefront of my mind when I, myself, have been pushing it further back in my mind. I love to write and over the past few years, I've found that writing this blog has been just as cathartic for me as running. In the back of my mind, the far corners of my brain, really, I've thought that maybe I'd like to pursue writing even further and write articles or maybe even a book someday. I'm not sure if fear or insecurity has kept that thought in the background, but it's time to push that goal to the forefront and start to make it a reality. I want to write a book someday about running and weight loss and hopefully inspire others to reach their goals, both health/fitness goals and general life goals. With that being said, first and foremost, I want to resume regular blogging! 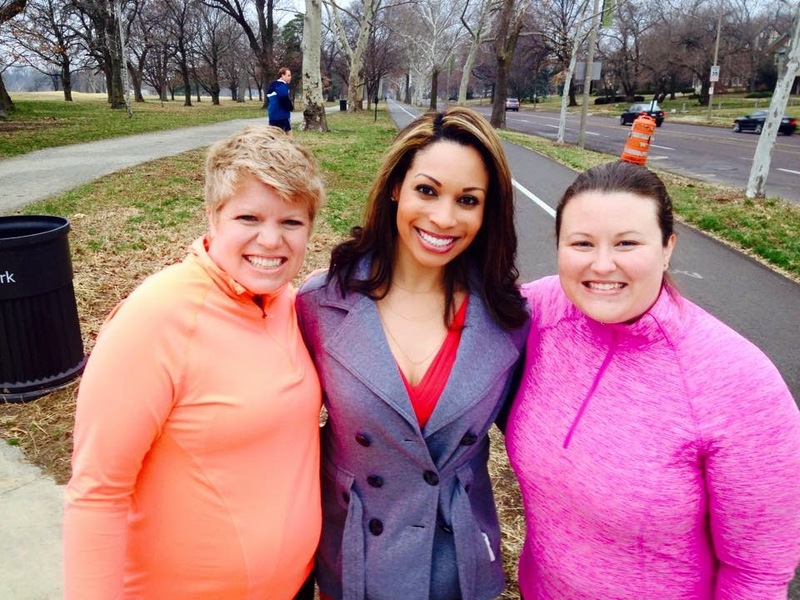 This morning, I had the wonderful opportunity to speak to Nichole, a morning anchor for our local NBC affiliate along with my "runching" buddy, Stacy, about the importance that running has played in our lives. It was an honor and pleasure to talk to her as part of a story they are doing about women and running. Talking about running and the impact it has had on my life was reinvigorating and the perfect reminder to challenge myself and get back to my running roots. As if the morning wasn't exciting enough, Stacy and I decided to get breakfast after talking to Nichole and we went to the cafe at the visitors center at the park near our office. As we sat and talked, I noticed a woman go by with a friend and I thought she looked familiar. I told Stacy that I thought she was Amy Marxkors, who writes columns for our local Fleet Feet newsletter. I adore Amy's columns and I've shared some of her posts on my blog, because they are so timely, motivational, and inspiring. So often, I feel like Amy is speaking directly to me because her blog posts are so apropos. She headed on her way, but then returned awhile later and I told Stacy again that I thought it was Amy. Stacy encouraged me to step outside my comfort zone and go ask if she was, in fact, Amy. So, in true fangirl fashion, I went up to her and asked if her name was Amy and when she confirmed that was her name, I double checked and asked if she was Amy Marxkors who writes the Fleet Feet newsletters. It was her and we had a lovely conversation with her! She is just as delightful in person as she is in her posts and it was so nice to meet her and talk for a bit! The combination of talking to Nichole and Amy reignited my goal to run a full marathon someday. Yes, a full marathon. I told myself during my first half that I would never, ever do a full and I reiterated the same sentiment at mile 12.5 of my most recent half marathon a few weeks ago (recap to come soon!). I could not fathom doing another 13.5 miles at that point. 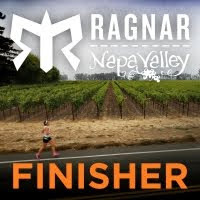 However, my wise Napa teammate, Erin, reminded me that of course I couldn't fathom a full at that point, because I hadn't trained for it. Light bulb moment for me, for sure. Mentally and physically at that moment, I was not prepared for a full, but when the time comes, I will train properly for it and will be ready for it. The full marathon is still a ways off; I'm thinking late 2016 or early 2017, but I'm putting it out there in the universe. It's big and scary, but most good things are, right? So there are two big, scary, exciting dreams that I am putting out there for all to see: pursue writing (continue writing, write articles, write a book) and do a full marathon! What are some of your big, exciting, scary goals and dreams, both short-term and long-term? To look within, to overcome. Loving myself enough. I have the will, the determination and the courage to defy the odds...and inspire. My challenges have made me a fighter - a survivor. They will not define me or confine me. I will run my own race. Different, beautiful and all my own. I believe in me and my potential. And I'm going to succeed because I'm brave enough to think I can. I brought my flower to Napa with me and I loved wearing it. It reminded me to believe in myself and I loved the extra pizazz it added to my hair! In 2012, Mel and Tori (the founders of Fellow Flowers) launched Declare It Day "to create an inviting space for women to not just declare goals but also feel supported in the process." This year, I decided to participate because I really want to push myself to run a 2:30 half marathon by the end of the year and I know it is going to be a challenge for me. I appreciate all of the resources that Mel and Tori provide to help with accountability, as well as support, and I hope that by putting my goal on paper and out into the virtual world that I can crush my goal by the end of the year! 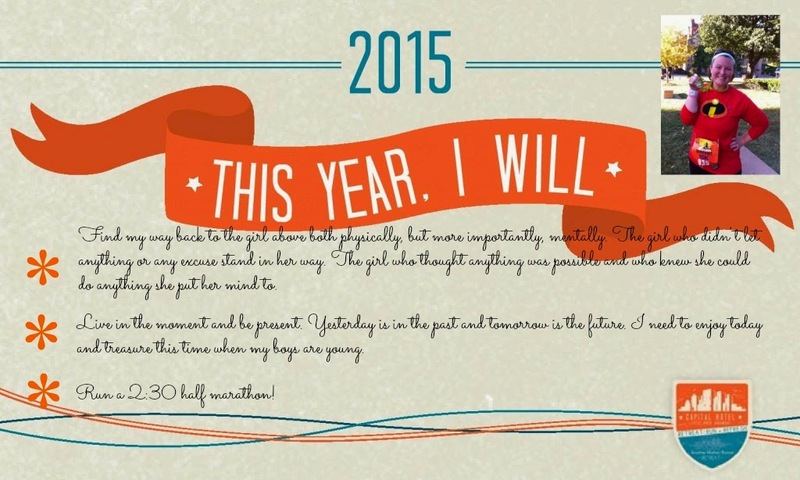 It's not too late to declare your goal for this year. Visit the Fellow Flowers Declare It Day website or the Declare It Day Virtual Party Facebook page for more information, including the Declare It Day declaration and a free Fellow Flowers Girls Guide to Goal Setting. I downloaded the guide the other day and I can't wait to dive into it; it's filled with inspiration and tools to help anyone reach their goals. I know that my goal is challenging, but it isn't impossible and I'm excited to push my boundaries and crush my goal by the end of the year. I've had some time to reflect on my post last week about where I am today, as well as absorb the kind words and great advice from many people, which was much appreciated. I feel like I am in a good place and am looking forward to a great 2015! Interestingly enough, the second item above was also one of my resolutions for 2014 (as I discovered while sifting through some blog posts from last year a few weeks ago), so clearly I still need to work on it, but I figure it is a good thing to keep in mind all the time.